Day four was lots of consults with specialists for the preliminary data collected yesterday and more data collection in the afternoon and night. We started off with another clogged IV for the blood draw. Our first meeting of the day was with neurologist Andrea Gropman, Division Chief of Neurogenetics at Children's National. Andrea took a thorough neurological history for Bertrand, and then examined him in detail. She was particularly interested his development, his seizure types, his movements and his medications. She also recommended specialists that might be able to work with his unusual presentation. After that, we met with Carmen Brewer in audiology. She explained in significantly more detail the exact nature of Bertrand's auditory problems. Mechanically, Bertrand hears well. Electrically, it's a different story. To my eyes, his ABR showed a "damped waveform," in which the characteristic peaks become increasingly difficult to distinguish as they go on. Carmen explained that people with this kind of "auditory neuropathy" can hear, but that complex sounds such as speech may be difficult to process. It's possible he recognizes the tone or cadence of our voice, but the words come out as gibberish. Music, on the other hand, when it's melodic, periodic and repetitious, may be easier for him to process. This could explain why Bertrand loves music (and always has), but doesn't respond to a dog barking right behind his head. It's not that he doesn't hear the dog: he may simply not understand the barking at all. After meeting with Carmen, we did a pit stop for Bertrand in his room and tried to get blood from his new IV from yesterday. The nurse tried everything he could to get blood out, but nothing worked. We had to get blood within an hour and a half in order to get it on a plane to California in time, so we were scheduled for another ultrasound-guided IV. In the meantime, we headed to meet with Wadih Zain, the ophthalmologist, knowing we'd have to bolt as soon as we got the call to go to IV ultrasound. And, this time, his eyes came out very dry! So, under general anesthesia: wet; awake: dry. After that, we got the call for the IV, since we only had 30 minutes to get the blood shipped. Once again, one vein, one shot, one direct hit. This was the easiest and best yet. Bertrand filled the tubes with 10 minutes to spare. After that, we had the sweat test and an electromyography exam (EMG). Apparently, kids sometimes cry or flinch during the sweat test. We were worried that it had triggered an absence seizure, so we touched him, and he instantly looked up, smiled and happy hooted. The physician gave us a confused glance. She had never encountered a child that seemed to be calmed by the process. 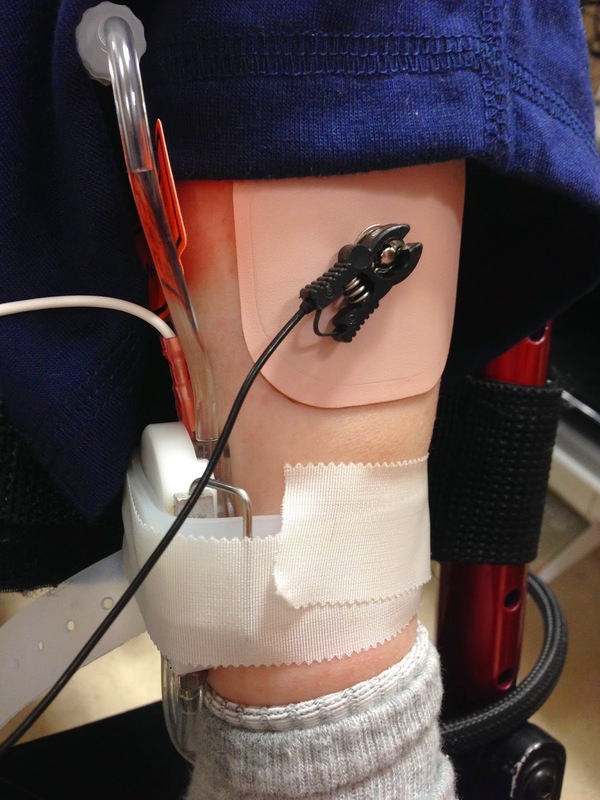 An EMG involves electrocuting nerves in the leg and arm to measure conductivity. Bertrand had an EMG at Duke, and it found peripheral neuropathy at the time. The EMG is a critical test because there appears to be demylenation with NGLY1, and we need to know how much. Right after the EMG started, 36 hours of constipation came to an abrupt end. Bertrand was characteristically upset for the next 10 minutes, but then passed out for the remainder of the EMG, including the brief needle test. After that, we took him back to the Children's Inn for cleanup and playtime until his sleep study / EEG starts tonight. Papa brought some delicious crabs and shrimp for dinner. Bertrand hasn't been thrilled with most of the other tests, but he felt strongly that a "sleep study" was an area where he could perform. As I write this, he's been sound asleep for about an hour. We're looking for signs of sleep apnea and for seizures. I'm on the first shift. Nana is on second. In the times we met with Lynne Wolfe today, she shared more of the early lab findings trickling back. In particular, we got the first evidence that Bertrand may also be suffering from secondary mitochondrial dysfunction, as some other NGLY1 patients do. This is an exciting development, and while I wouldn't wish mitochondrial dysfunction on any other NGLY1 patients, finding more consistency in the phenotype is highly informative.